"Technology is a great servant but a terrible master. 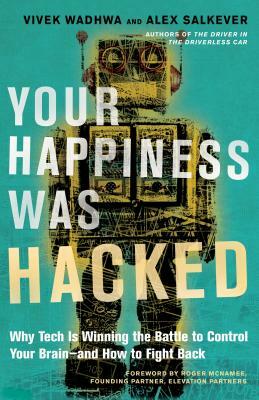 This is the most important book ever written about one of the most significant aspects of our lives--the consequences of our addiction to online technology and how we can liberate ourselves and our children from it." Technology: your master, or your friend? Do you feel ruled by your smartphone and enslaved by your e-mail or social-network activities? Digital technology is making us miserable, say bestselling authors and former tech executives Vivek Wadhwa and Alex Salkever. We've become a tribe of tech addicts--and it's not entirely our fault. Vivek Wadhwa is an entrepreneur, a technologist, and a professor at Carnegie Mellon University's College of Engineering. A globally syndicated columnist for the Washington Post, he coauthored with Alex Salkever The Immigrant Exodus (an Economist 2012 Book of the Year) and The Driver in the Driverless Car (long-listed for the Financial Times and McKinsey 2017 Business Book of the Year). Alex Salkever is an author, futurist and technology leader. He co-authored with Vivek Wadhwa "The Driver in the Driverless Car" and "The Immigrant Exodus". He is a columnist for Fortune and previously served as a Vice President at Mozilla as the Technology Editor of BusinessWeek.com and as a Guest Researcher at the Duke University Pratt School of Engineering.